STUDENTS from a Woking school were invited to march through London’s Whitehall for their 25th traditional annual parade recently. 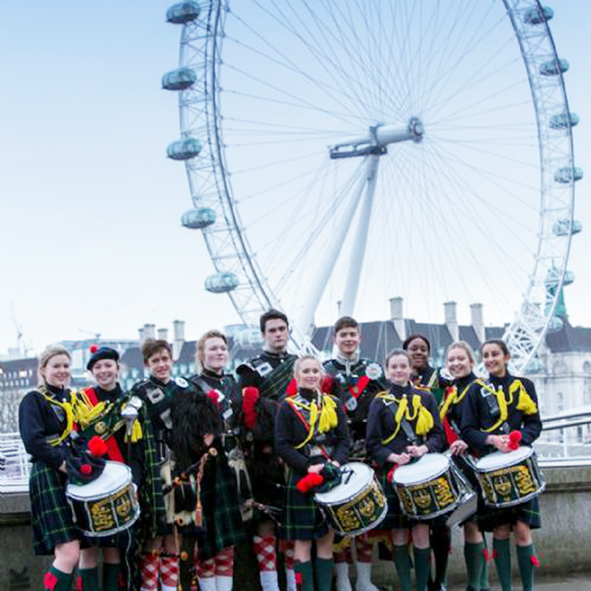 The Gordon’s School pupils, along with their Pipes and Drums Band, assembled in their ceremonial ‘Blues’ before marching across London. They marched past crowds of proud parents and onlookers to the statue of General Charles George Gordon on the Embankment at the bottom of Horse Guards Avenue. On arrival, school Chaplain, the Reverend Denis Robinson, led the Memorial Service to commemorate the death of Christian soldier hero, philanthropist, and school namesake General Gordon. Communications Officers for the school, Sarah Hooper, said: “It was particularly memorable as it was the Chaplain’s last Whitehall service with Gordon’s before he retires later this year. “As always, we were honoured to be able to uphold our tradition. As the only school granted permission to march through Whitehall, once again our staff and pupils represented Gordon’s to the highest standard, of which the General himself would have been proud. The Guildford Cathedral Memorial Service for the whole school took place the following day, on Sunday 15 January, where this years’ sermon was given by the Rt Revd Christopher Herbert, assistant Bishop in the Diocese of Guildford, formerly Bishop of St Albans.